Davis has been pushing the transportation study before the Commission and the regional transportation coordinating body MACORTS since June of 2015 as a way to justify the flyover by documenting heavy traffic flow on the SR 316 corridor. 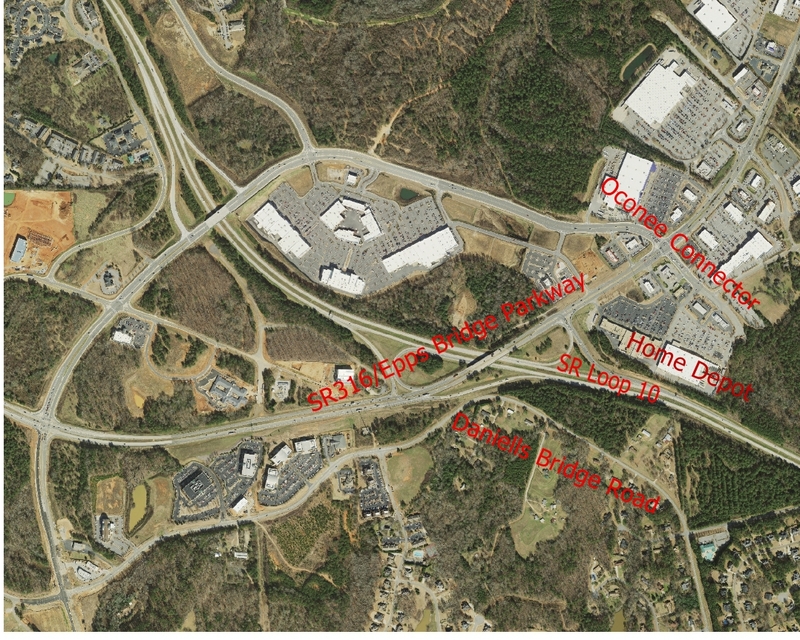 On Tuesday, the Commission will get a report from county Public Works Director Emil Beshara on three bids received for a study of both SR 316 and Epps Bridge Parkway within Oconee County. The agenda makes no specific reference to the Daniells Bridge Road flyover. The Commission also will hold a hearings on two rezone matters and consider awarding a bid for $3,395,298 for construction of the McNutt Creek Sewer line between Jimmy Daniell Road and Jennings Mill Road. The meeting starts at 7 p.m. in the Courthouse in Watkinsville. The successful bidder is to hold at least two community meetings, identify costs, and prepare a final study document with recommendations. The county has received bids, as yet not released to the public, from Moreland Altobelli Associates of Duluth, Pond and Company of Peach Tree Corners, and Design Workshop of Ashville, N.C. The county has a close relationship with Moreland Altobelli, which has done the design work for the Mars Hill Road and Experiment Station Road widening. The proposed flyover, which has been opposed by many in the residential areas along Daniells Bridge Road (including in Welbrook Farms subdivision, where I live), has become an issue in the election for the Post II opening on the Board of Commissioners. Candidate Ben Bridges has not taken a stand on the flyover, but Chuck Horton has said he is opposed to the flyover and Marcus Wiedower has said he is favor, though he has said he wants a design that will minimize the impact on the residential areas. Wiedower cited traffic congestion on Epps Bridge Parkway as the reason for his support. The issue came up in the Candidate Forum held by the two Oconee County Rotary Clubs on Oct. 13 as well as in one-on-one interviews I did with Bridges, Horton and Wiedower late last month. The column is on the county’s web site. The Rotary Clubs have not held candidate forums in the past. Davis is an active member of the Oconee County Rotary, which joined the North Oconee Rotary is hosting the event. The second question that moderator Charles Bullock, a University of Georgia political science professor and Rotarian, asked was about the Daniells Bridge Road flyover. Bullock told me that the questions came from the Rotary clubs and the University of North Georgia Student Government Association. The event was held at the Watkinsville campus of the University of North Georgia, and Bill Ross, who owns land across from Home Depot and has been a strong proponent of the flyover, was prominent in the audience. OCO: Candidate Forum 10 13 16 Daniells Bridge Road Flyover from Lee Becker on Vimeo. I asked each of the three candidates for his stand on the flyover in the one-on-one interviews I did, based on my knowledge that Chairman Davis was continuing to push the project. Wiedower’s answer was tentative until I pointed out to him that Tom Kittle, who lives on Daniells Bridge Road at the intersection of Chestnut Hill Road, had a large sign of Wiedower’s in his front yard. Kittle, whose property would be dissected by the roadway, has said he wants to sell his property for development and has been very vocal in support of the flyover. The only commercial property in the area at present is Summer Hill Recreation Club, which is zoned residential but operates with a conditional use permit. Wiedower has a sign in front of that property as well. The responses of the three candidates to my question on the flyover is in the video clip below. OCO: BOC Candidates On Daniells Bridge Road Flyover from Lee Becker on Vimeo. On April 7, 2015, after months of pushing by Davis and delays in making a decision, the Commission voted 3-1 to turn down two project framework agreements from the Georgia Department of Transportation to move forward with the flyover and to widen Daniells Bridge Road. A crucial issue was how the four or five lanes of traffic from the flyover would meet with Daniells Bridge Road. The image below is for 2016 and comes from the county’s GIS office. I provided the labels. 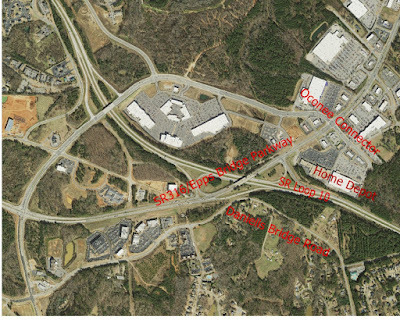 The map shows the stub of the Oconee Connector at Home Depot and the existing Daniells Bridge Road. No concrete plans were ever provided, either for the route of the flyover or for the intersection with the existing roadways south of the flyover itself. Commissioner William “Bubber” Wilkes was in favor of moving forward, and Davis needed only one other vote for him to be able to break the tie and move forward with the projects. In June of 2015, Davis suggested that the county should initiate a study of the SR 316 and Epps Bridge Parkway corridor, and that met with some acceptance, particularly from then Commissioner John Daniell, who was the key swing vote against the projects in that April 7 vote. Daniell is unopposed on the Nov. 8 ballot for BOC Chair, to replace Davis when he retires at the end of the year. Since June of 2015, Public Works Director Beshara, on Davis’ behalf, has sought funding for the study from the Madison Athens Clarke Oconee Regional Transportation Study (MACORTS), the regional transportation planning body, but without success. Over Davis’ objections but with the support of the county’s Citizen Advisory Committee for Land Use and Transportation Planning, Beshara did get MACORTS to rank the funding priority for a flyover of SR Loop 10 at the Oconee Connector ahead of the Daniells Bridge Road flyover. The flyover and widening of Daniells Bridge Road were paired in the GDOT documents before the Commission in 2015, with the argument that the increased flow of traffic across the flyover would necessitate the improvements to carry the traffic to Hog Mountain Road and beyond. Wayne Provost, now retired but then director of Strategic and Long-Range Planning for the county, argued that increased residential development along Daniells Bridge Road also would make the widening necessary. In the meantime, David Mulkey, who owns property in the part of Old Farm subdivision on Cliff Dawson Road, has bought 188 acres lying between Daniells Bridge Road and Cliff Dawson Road. At present, the land is zoned for an 193-lot subdivision, but the county has advised Mulkey that he should downzone the property to agricultural to accommodate his plans for the property. As of yesterday (Friday), Mulkey had not submitted any paperwork for the downzoning of his property. Mulkey did clear trees along the frontage of the property on Daniells Bridge Road this week, however, as he did earlier this year on the property along Cliff Dawson Road. He has since built a rustic wood fence separating his property from the Cliff Dawson Road. The grass will help with erosion control, Beshara said. Consideration of the three bids for the SR 316 corridor study is near the end of the agenda on Tuesday night. Before that, the Commission will consider a request by Saphire Properties to rezone 2.2 acres on the west side of Jimmy Daniell Road north of SR 316 from agricultural to Office-Institutiona-Professional to allow for development of two office buildings totaling 7,000 square feet in space. The staff report notes that the property has both residential property nearby and an undeveloped commercially zoned property adjacent to it. The staff recommended approval of the rezone, and the Planning Commission recommended approval at its meeting on Oct. 17. The video of that meeting is available on the Planning Commission Channel of the Oconee County Observations Vimeo Site. Penny Mills recorded the video. The county will also hear a rezone request from Christopher Cagle who is seeking to divide his 10.2 acres on Dove Creek Road in the west of the county into two parcels. Staff has recommended approval. Oconee County Utility Department Director Wayne Haynie will ask the Board of Commissioners on Tuesday night to approve a contract with Site Engineering of Atlanta for construction of two miles of 18-inch gravity sewer line along McNutt Creek. Site Engineering’s bid of $3,395,298 was low among three bidders for the project. The cost will go up about $800,000 if the county decides it will be better to create a tunnel for the line under SR Loop 10 rather than bore through the earth beneath the roadway, Haynie told the Commission at its meeting on Oct. 25. Most of the line will run through Jennings Mill Country Club. The county had expected the project to cost between $2 million and $2.5 million, Haynie told the Commission, but the cost went up because of changes made in the design to minimize damage to the golf course. The video of that Oct. 25 meeting is available on the Board of Commissioners Channel of the Oconee County Observations Vimeo Site. Sarah Bell recorded the video. A flyover bridge would cost the county millions while only benefiting a handful of property owners friendly with Melvin Davis and Athens realtor/State Transportation Board member, Jamie Boswell (oh the conflicts of interest Mr. Boswell). Melvin, give some hard proof done by a third party to show the need and value of the flyover, not your opinion. But it's hard to trust any report coming from the county after the sham report issued by our county's Economic Development director about the auto dealerships drafter by the auto dealership's manager. It would do little to alleviate traffic but would absolutely make Daniells Bridge road an unbearable cut-through. Once again incoming commission chair John Daniell, Horton, Bridges & Wiedower: Demand this decision is made by the new commission, not the current lame duck commission. Beshara proposed to the Land Use Committee that it modify the project to more accurately reflect what would be built if the county were to move forward with the extension and flyover as a state and federally-funded project. The Land Use Committee overwhelmingly accepted Beshara’s suggestion. The modified plan, Beshara said, would cost about $20 million. It also would involve straightening and widening Daniells Bridge Road from the terminus of the flyover all the way to the Oconee Connector. $20 MILLION for the flyover??!! Heck NOOOOOOOOO!!!!! King Melvin, don't even think about pushing this through during your last few weeks of lame duck status. This project is unnecessary and ridiculously expensive. Who does it really benefit? A handful of property owners and an Athens realtor (Bishop). Chairman Davis continues to try to help his wealthy friends as his time draws to a close. I hope the commission (except for Mr. Wilkes who does whatever Mr. Davis says) won't give into this.